“Quite unexpectedly I found an interesting reference to go in a non-fiction book that I am currently reading, ‘The Broken Seal,’ by Ladislas Fargo,” writes Erwin Gerstorfer. “This book, first published in 1967, deals with the hidden war between American and Japanese code breakers from WW1 to Pearl Harbour. In discussing Admiral Isoroku Yamamoto (left), the “brain” behind the attack on Pearl Harbour, Fargo mentions that Yamamoto was considered one of the strongest go players in the Japanese Navy (he enjoyed other games too, like Shōgi, Bridge and Poker). 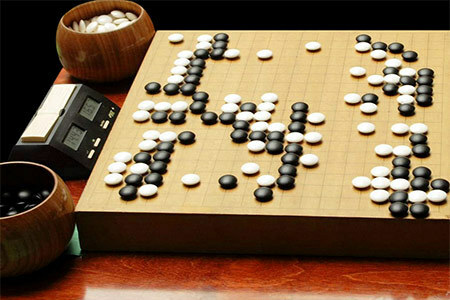 For me it was not too surprising that Yamamoto played go, as many members of the Japanese Navy were fond of it (see e.g. Ukiyo-e below right), but I did not know that he was such a strong player. However, when I checked the curriculum vitae of Admiral Yamamoto in Wikipedia I got another surprise. While go is listed on the German Wiki among other games that Yamamoto enjoyed, in his English Wiki entry go is not mentioned at all. This is quite a contrast to the fact that he was an expert go player. Yamamoto was killed when American codebreakers identified his flight plans and his plane was shot down.